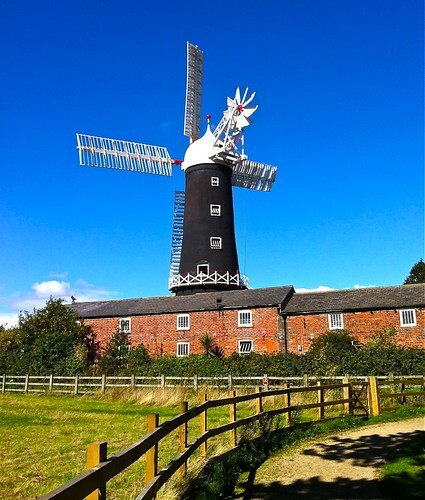 On Saturday, we decided to cycle up to Skidby Mill, a working windmill restored with Lottery funding (what isn’t these days? ), with a Museum of Rural Life attached. It’s not that far – about 6 miles, maybe – but there was a vicious headwind most of the way there, and the last bit is decidedly Up. To my shame, I couldn’t quite manage it, and had to push. And my calves ache like mad! The museum is beautifully done out, with photographs of and quotations from people who worked the land in the 1930s and 1940s, and some “hands on” exhibits for people to try grinding grain between stones again. I was quite taken aback to be charged £1.75 entrance, as I thought museums were free these days, but it was well worth the money. You can climb right up to the top and see the miller milling (though I didn’t, as I’d never have got down again). You can buy the flour they mill, so we did, and we had a cup of tea and a very nice scone in the tearoom before heading home. It was glowering a bit when we left, but the rain held off. We came back via Morrisons (so just over 12.5 miles all told) and bought some bits, which I stowed in my nice new rear bike basket – I’m very pleased with that, as it means we can go a bit further afield for shopping without the car. Pete is very hardy, and carries heaps of stuff in a rucksack, but my back doesn’t like that. I picked up some greengages for 50p, marked as exotic fruit (really? greengages? ), and some white pudding, which I love – you hardly ever see it down south. In the afternoon, I made a couple of banana and coconut cakes as an experiment, as we had a kilo of desiccated coconut in the larder. I have no idea why we bought such a huge bag, and working through it is going to take some time. Sunday dawned grey and cold and rainy, and it stayed like that all day, which was irritating as I’d wanted to pop into town. Instead, we had a small but beautifully formed fry up for breakfast (1 rasher, 1 sasuage, 1 egg, 2 slices of white pudding, some fried potatoes). Then we turned a half shoulder of lamb into slow cooked lamb and lentils, and put up with the smell all afternoon. I watched Gosford Park in the afternoon, and the day was, generally, slumpage. First weekend day we’ve spent completely at home since last winter, I think, but was quite nice nonetheless.